In that day, there will be an altar to the Lord in the midst of the country of Egypt and a pillar to the Lord at its border. It will be a sign forever to the Lord in the country of Egypt, for they will cry to the Lord because of their oppressors, and the Lord will send them a Man who will save them. He will judge and save them. Then the Lord will be known to the Egyptians, and in that day the Egyptians will know the Lord and offer sacrifices. Yes, they will make vows to the Lord and pay them. The Coptic Church was established in the name of the Lord Jesus Christ by St. Mark the Evangelist in the city of Alexandria around 43 A.D. The church adheres to the Nicene Creed. 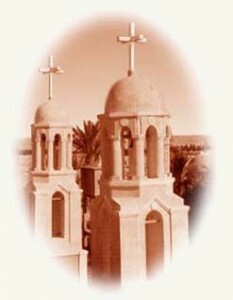 The term “Coptic” is derived from the Greek “Aigyptos” meaning “Egyptian“. When the Arabs arrived in Egypt in the seventh century, they called the Egyptians “qibt“. Thus the Arabic word “qibt” came to mean both “Egyptians” and “Christians“. The term “Orthodoxy” here refers to the preservation of the “Original Faith” by the Copts who, throughout the ages, defended the Old Creed against the numerous attacks aimed at it.